Indiana Business Journal: Did Indiana Democrats get caught up in a Donald Trump tsunami in this election or did they simply fail to pick progressive candidates who could tap into the frustrations of working-class voters? It’s a question they’ll be trying to answer as they autopsy big losses they suffered Nov. 8 when their establishment candidates—John Gregg in the governor’s race and Evan Bayh in the Senate contest—got trounced. “The ultimate takeaway is, there’s a sense that the establishment has failed people,” said South Bend Mayor Pete Buttigieg. But some Democrats say it was President-elect Donald Trump’s decisive victory in Indiana that propelled Republicans to success in the key races: Republican Eric Holcomb was elected governor. U.S. Rep. Todd Young was elected as the next U.S. senator. State Superintendent of Public Instruction Glenda Ritz, the sole Democrat holding statewide office, lost to newcomer Republican Jennifer McCormick. 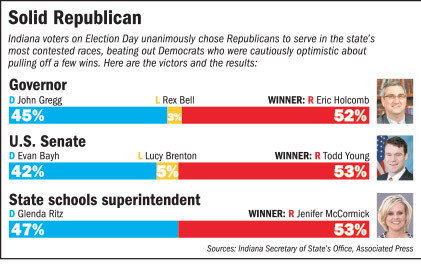 And the GOP held onto its supermajorities in both chambers of the Indiana General Assembly. Maybe it was pride talking, Harris acknowledged, but he was unsure how Indiana Democrats could top the fundraising and organization Gregg’s team accomplished. The former House speaker raised more than $13 million, more than doubling the amount he raised in his unsuccessful 2012 gubernatorial bid against Gov. Mike Pence. It’s hard to overstate how unusually promising the Democrats’ chances seemed just a few months ago. There was jubilation from the party that Bayh—the biggest name in Indiana politics—had jumped into the Senate race, tagging out Baron Hill, who seemed assured to lose to Young. But ultimately, the voters decided they’d had enough of establishment candidates nationally and statewide. “What we saw is a lot of people who were overlooked or who felt overlooked asserting themselves at the polls,” said Buttigieg, who is widely considered to be a young star of the Democratic Party. So where do Democrats in the Hoosier state go from here? As far as leadership goes, Bayh and Gregg might not appear again in Indiana politics. 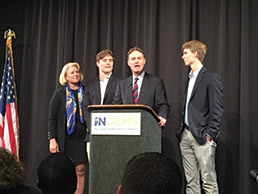 Bayh told supporters he’d be “ready in the years to come to help my fellow citizens in any capacity they see fit to have me.” Gregg acknowledged this could be the last time his name is on the ballot, but he praised his running mate, Democratic state Rep. Christina Hale, and said she had a bright future. Harris said the party needs to build its bench by “investing in young people” and “come back and offer ideas” for Indiana. While Gregg and Bayh were mainstream candidates, Indiana Democrats picked Bernie Sanders over Hillary Clinton in the presidential primary, raising the specter that they’re looking for more progressive options. Buttigieg said voters need to be sure that, once in office, a leader will take action on issues that matter to them. Democratic strategist Jennifer Wagner said political parties—as machines that once recruited candidates, trained campaigns and funded races—are becoming less relevant. “We’ve got a system where candidates, by whatever means possible, have to distinguish themselves from the rest of the pack and prove to the big-money backers that they can win … so they can get the cash infusion to get in the game,” Wagner said. Jesse Kharbanda, a Democratic candidate who lost a close Indiana Senate race in the Indiana primary, stuck around at the Democratic event long after most supporters had left. He said he was disappointed in the outcome, especially for Gregg’s loss, but he expressed confidence in the Democrats’ message for the future. “How we uplift working families remains a very powerful focus of the party,” Kharbanda said. “They developed a really thoughtful set of proposals and were just caught up in the whirlwind of national trends.